Designed for the discerning, value conscious outdoor enthusiast and bird watcher, the new Barr & Stroud Sierra Dual-Speed spotting scopes are possibly the best value in the market today.Featuring optical performance equal to, or better than any competitor’s product line, the Barr & Stroud Sierra is waterproof and features rugged armoured construction for years of performance. • Multi coated lenses and Bak-4 Prisms – All Sierra spotters feature Bak-4 prisms and are fully multi coated, precision ground lenses to provide optical performance that is equal to, or better than anything in its class. 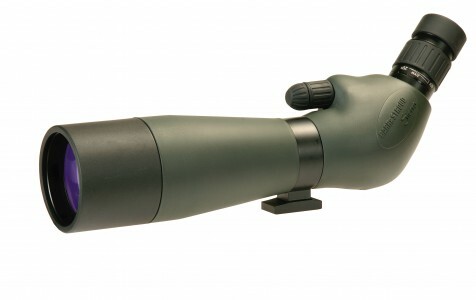 • Polycarbonate construction – All Sierra spotting scopes are manufactured from lightweight polycarbonate which reduces overall weight and makes it extremely rugged and durable. • Rubber armour covered – A rugged rubber armour covering quietens down bumps and protects your Sierra spotting scope from abrasions and damage from regular use. • Waterproof, Fog proof & Nitrogen Filled – All Sierra Series spotting scopes are waterproof, fog proof and nitrogen purged to ensure many years of performance. • Built-In Sliding Sunshade – Each Sierra spotting scope features a sliding sunshade that is built-in to the objective lens of the scope to further reduce glare.